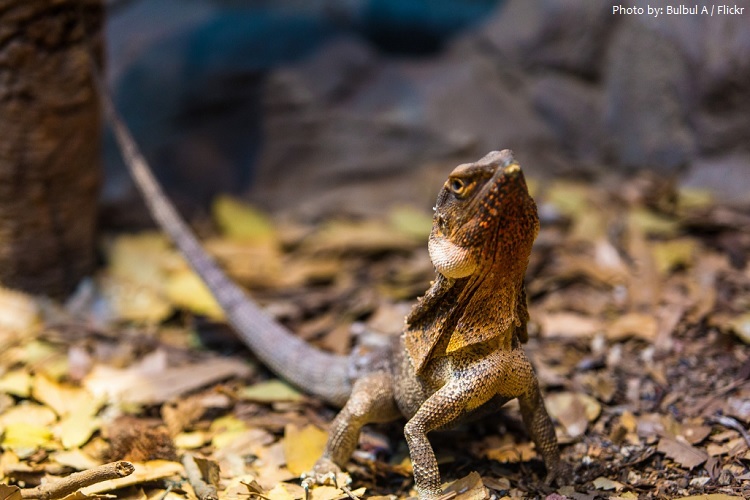 The frilled lizard also known commonly as the frilled agama, frilled dragon or frilled-necked lizard, is a species of lizard in the family Agamidae. It is found across northern Australia and southern New Guinea. 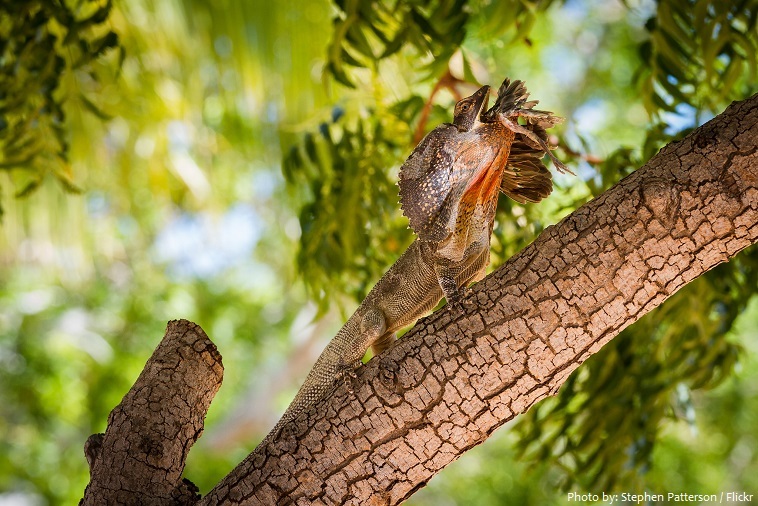 The frilled lizard lives in the subhumid to semi-arid grassy woodlands and dry sclerophyll forests. The lifespan of the frilled lizard is about 10 years in the wild and up to 20 years in captivity. 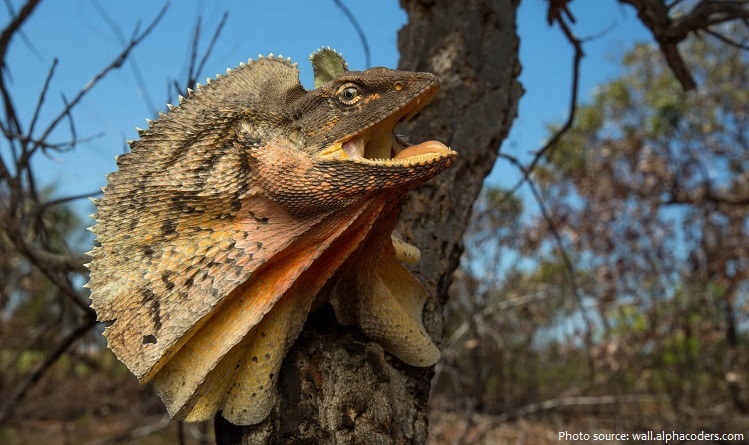 The frill-necked lizard is a relatively large member of the agamid family, growing up to 85 centimeters (2.8 feet). Coloration tends to be brown or gray with spots and blotches of darker colors mixed in a mottled fashion to give the appearance of tree bark. There is not one standard colour: rather, colouration varies according to the lizard’s environment. For example, a lizard found in a dryer, clay filled environment will most likely have a collage of oranges, reds, and browns; whereas a lizard found in a damper, more tropical region will tend to show darker browns and greys. 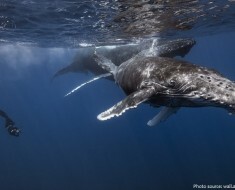 This suggests they are adapted to their habitats; their colors are a form of camouflage. The tongue and mouth lining are pink or yellow. Its most distinguishable feature is the large Elizabethan-like ruff or frill that it raises abruptly around its neck when it becomes alarmed. The neck frill is simply a thin but extensive fold of skin surrounding the throat, which when fully erected may measure about 30 centimeters (12 inches) across. The frill lies like a cape over its shoulders until erected. 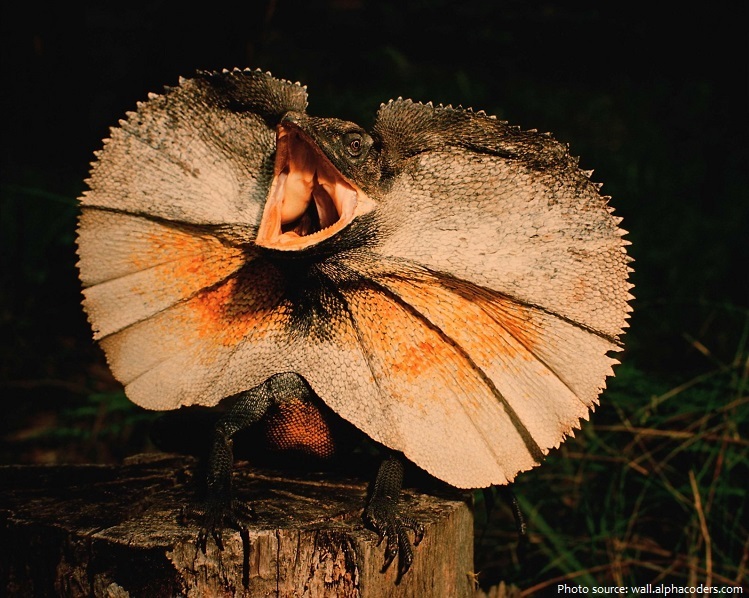 The Frilled Lizard is a diurnal lizard meaning that they are active during the day and are resting in the night-time. The lizard is arboreal and spends most of its time on trunks and limbs of standing trees. Due to its excellent camouflage, it is usually observed only when it descends to the ground after a rainfall or to search for food. The frilled lizard can run standing up on its hind legs with its forelegs and tail in the air. 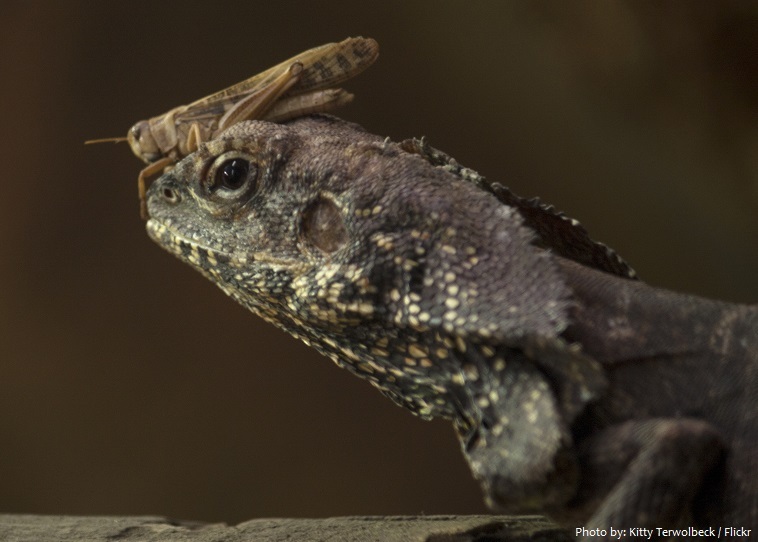 Like many lizards, frill lizards are carnivores (meat-eaters), feeding on cicadas, beetles, termites, and mice. They especially favor butterflies, moths and their larvae. Though insects are their primary source of food, they also consume spiders and occasionally other lizards. This species is oviparous. 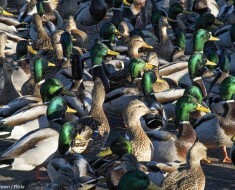 The mating season beginning in October or November and lasting until February or March. Females lay eggs during the wet season, and the eggs must incubate for about 70 days. 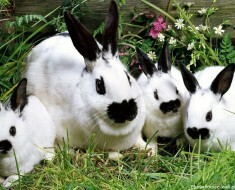 Clutch size ranges from 4-13, with an average of 8 eggs per clutch. 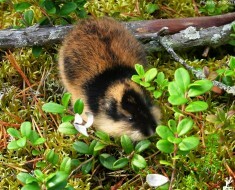 The eggs are laid in a nest 5–20 cm below ground, and usually in sunny areas. 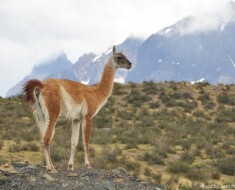 Gender is partly temperature determined, with extreme temperatures producing exclusively females, and intermediate temperatures (29 to 35 °C) producing equal numbers of males and females. Similar in look to the dilophosaurus seen in “Jurassic Park,” the frilled lizard can be a temperamental breed that makes an interesting pet for those looking for something unique. 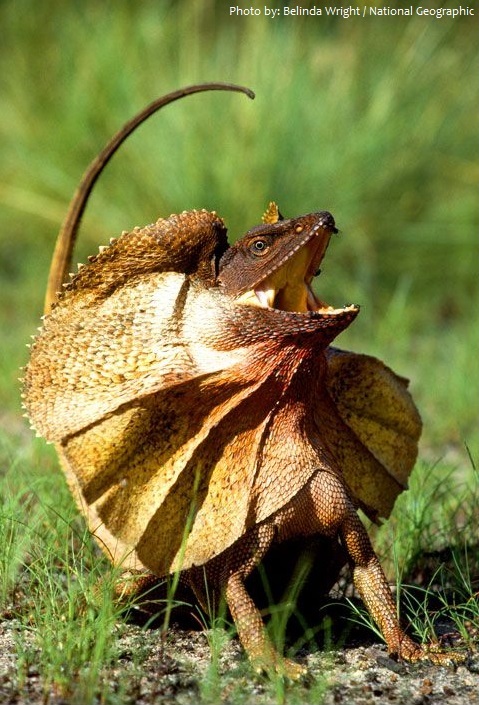 Frilled lizards are docile creatures that aren’t normally aggressive toward humans. 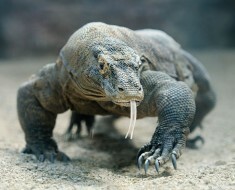 However, these aren’t the type of lizard that enjoy being handled. British zoologist John Edward Gray described the frill-necked lizard in 1825 as Clamydosaurus Kingii, from a specimen collected by an expedition conducted by Captain Phillip Parker King from HMS Mermaid. King’s specimen was obtained by his ship’s botanist, Allan Cunningham at Careening Bay off the northwest coast of Australia. The generic name, Chlamydosaurus, is derived from the Ancient Greek chlamydo (χλαμύς), meaning “cloaked” or “mantled”, and saurus (sauros), meaning “lizard”. The specific name, kingii, is a Latinized form of Phillip Parker King’s last name. It is the only member of this genus.